The new Innovate Motorsports Digital MTX-L Plus features patented DirectDigital™ technology and all-new Advanced Sensor Control which receives feedback from the sensor more frequently and optimizes heater control. 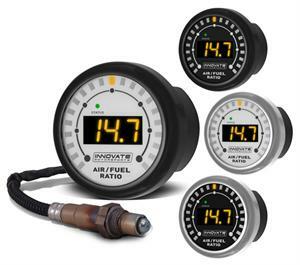 The combination of these technologies makes the MTX-L Plus our fastest, most durable and accurate air/fuel ratio gauge ever! Optional heat sink recommend for turbo/supercharger applications with O2 sensor mounted in manifold. • Serial IN and OUT ports allows for easy tuning, logging.